I told you in my last post that I would tell you about the mama and babies that we recently rescued, but it is sort of a sad story, and I don't feel like re-living it. Annie needs a little extra attention right now soooo, this post is about her. Warning....picture overload! If you remember, Annie was a rescue. My nephew says that he found her on the side of the road, and then just happened to stop by our house with her, but I have never really felt that he was telling the truth. Nonetheless, we kept her and fell completely in love with her. She would follow me to the cabin when I would work on furniture, and make every step that I made until she just couldn't go anymore, then she would get in this old drawer and take a little power nap. Look how cute! Annie just loves her humans, and would follow hubby to his shop, garden, or anywhere else that he went. This is Annie all grown up now, and of coarse ya'll know Sophie Parsons. Annie even loves Soph, and Sophie is not always nice to poor Annie. Annie is always so tolerant and forgiving of Sophie, but this is just part of Annie's personality. Annie has unconditional love for everyone that she meets. This is Annie and her marshmallow. She loves a roasted marshmallow. I will build a fire sometimes and roast her marshmallows, and she inhales them, but she likes them not roasted also. She had this one buried in the dirt, as you can see. The only time Annie has ever stood up to Sophie was when Sophie tried to take her marshmallow. This is Annie and the pups that were rescued. When I first brought the pups home, I wouldn't let Annie in the backyard with them and the new mom. Annie was beside herself, shaking, howling, and cutting up side ways to get to the pups.....but I had no idea what she would do if she got to them. I should have known, because Annie is one of the sweetest dogs that I have ever owned. Anyhoo, I think this was the second day that she was with the pups, and she acts more like their mom than the mama dog does. Annie hasn't spent a night away from the babies since she was allowed to interact with them, until Monday night, and the accident. They love her, and she loves them. She loves the mama dog as well, and they are like a long lost family. 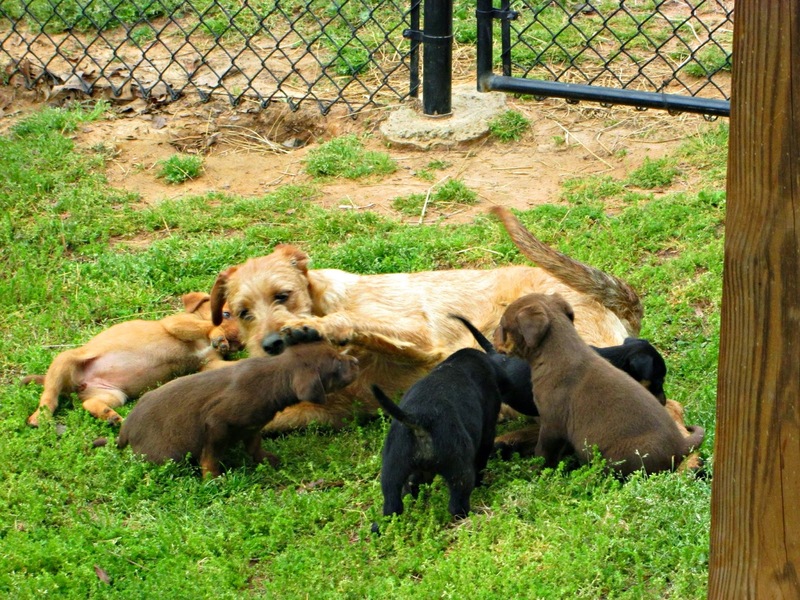 It is almost like this mama dog and her pups have made Annie's life complete. It is so sweet how Annie has welcomed them into her world. 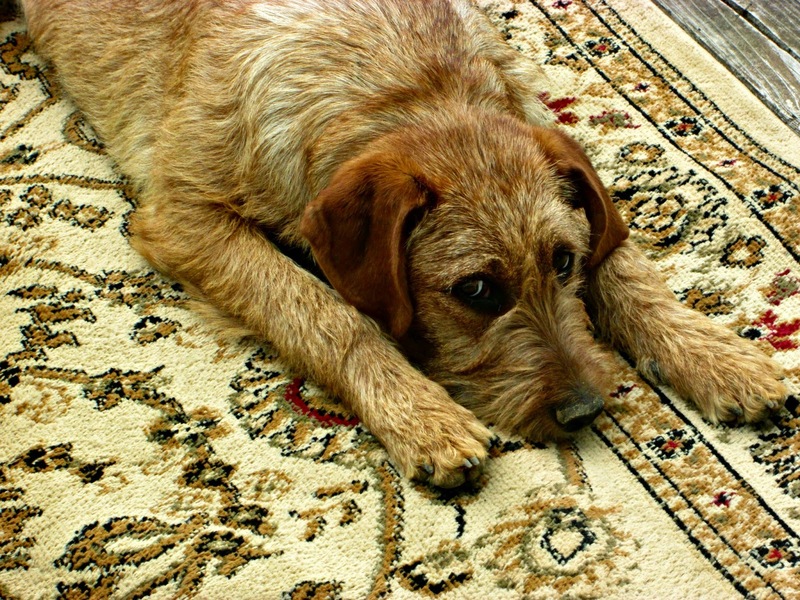 Monday night, Annie and the mama dog (Dolly) were running and playing, and Annie knows only one speed, which is HYPER. She ran into this blade with these sharp points, and when she did, they went under her skin and tore her right side pretty much off. I have pictures, but won't share due to it is not pretty. We ended up at our Vet's office that night, and she had to keep Annie due to the extent of her injury. This is Annie and the pups when she arrived home the next day. These babies were sooo happy to see their Annie, and so was I! She has to wear the cone because of the sutures and the drainage tubes, but it really hasn't slowed her down. She was in the pool the day she came home, but we had to help her out because she was still too sedated and tired to swim. 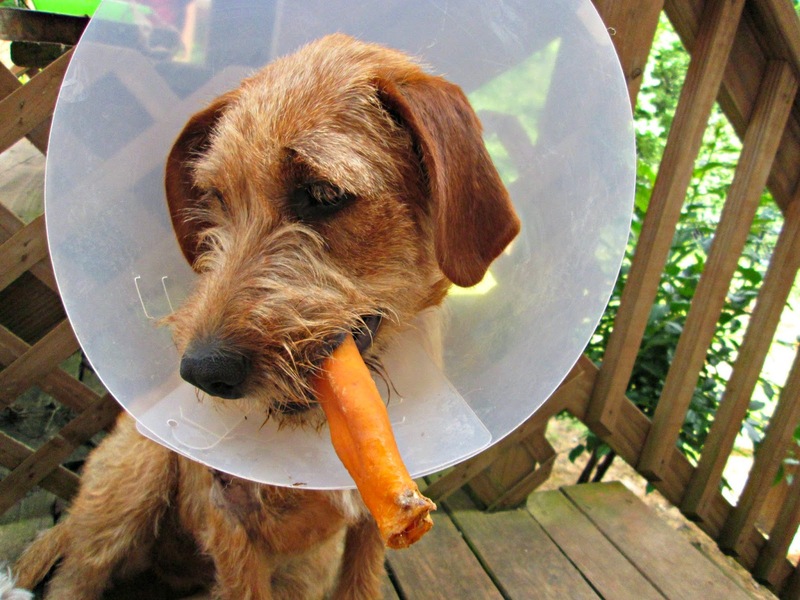 She is on antibiotics and anti-inflammatories for now, but you can't keep a good dog down. We are so glad that our Annie is ok, and I can't imagine our farm without her!! Ok....on to our latest DIY project. I have wanted a stone fireplace forever. Hubby even went so far as to contact the brick layers that did our brick, and they said no way. The stone would be too heavy because our slab wasn't built for it in the beginning. So...what's a girl suppose to do..just give up?? No way! There are several kinds of "faux" stone out there. Some still require "professional" installation, but some don't. 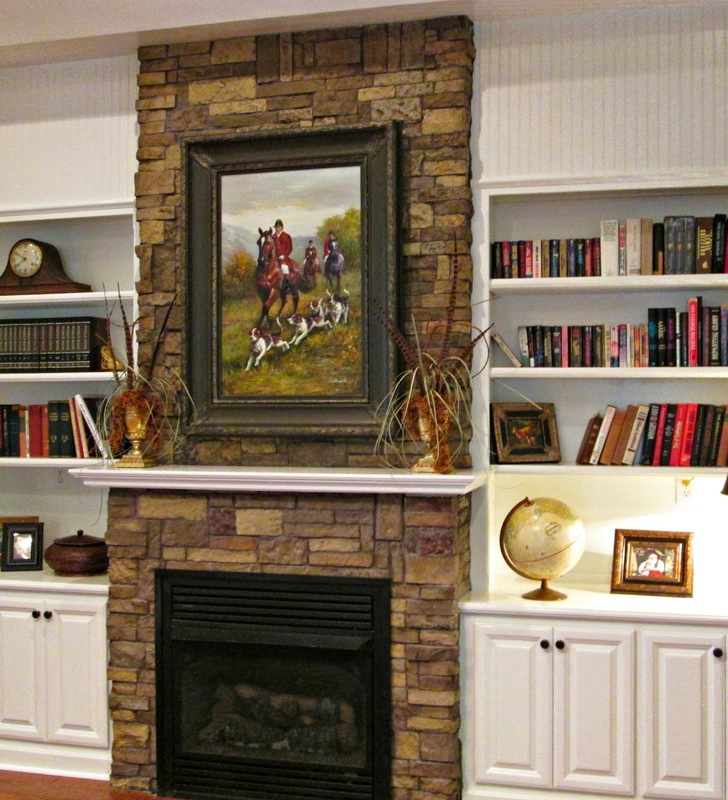 Well, take a look at my "faux" stone fireplace, that I did myself. It is airstone, from Lowe's. 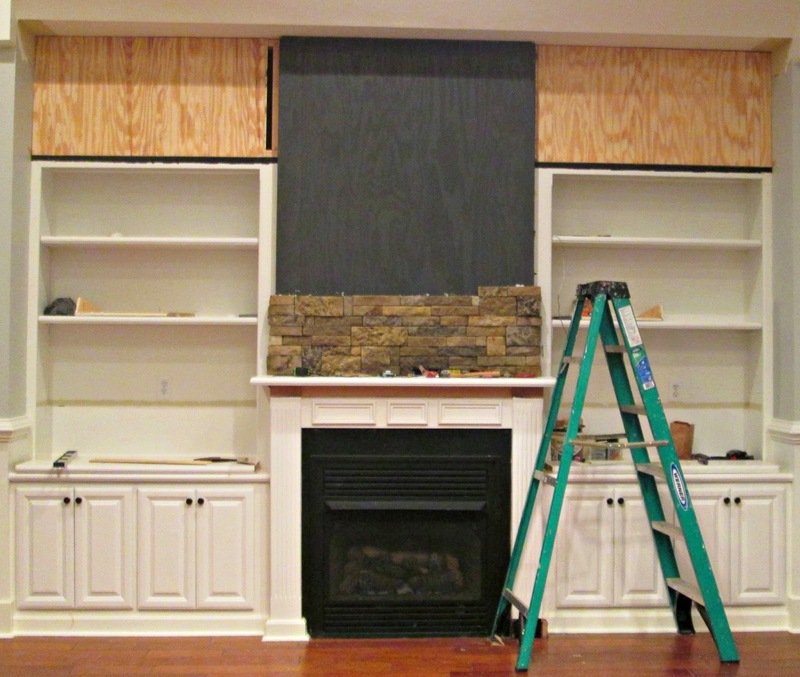 It is really easy to install, and doesn't require a wet saw to cut. There may be a few "imperfections", but what real stone is perfect? 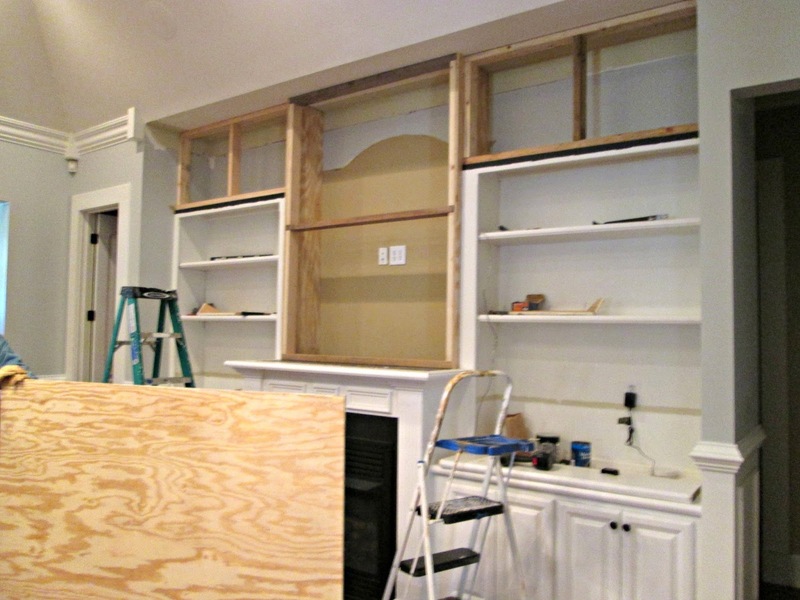 We started by tearing out the cabinets where the tv was, over the gas fireplace, and closing in the top of the bookcases. I knew that it would look more "massive" going all the way up to the ceiling, and I was sick of trying to find things to decorate above the bookshelves with. After hubby closed in the area above the fireplace so that I could lay the stone work, I painted it black so that if there were any cracks in between the stone, the black wouldn't be as obvious as the unpainted plywood....only to end up using grout for a more "real" look, so painting the plywood black was a waste of time. Then off I went! I wanted the stone all the way to the ceiling for that "massive" look. That was all that I had on my mind when I started! Oh, did I mention that the bottom part never really crossed my mind until I finished the top?? Oh no, It never crossed my mind to start from the bottom. Nope! So then I start ripping the bottom apart only to find a huge hole, with nothing but the gas insert sitting there. The two pieces of wood on the sides are the only thing holding this whole outfit up. But hubby came thru as usual. He had to rebuild the whole bottom part, and I was so thankful that the top part didn't come crumbling down!! I will start from the bottom and go up on the next one....yes, I already have plans for a next one. 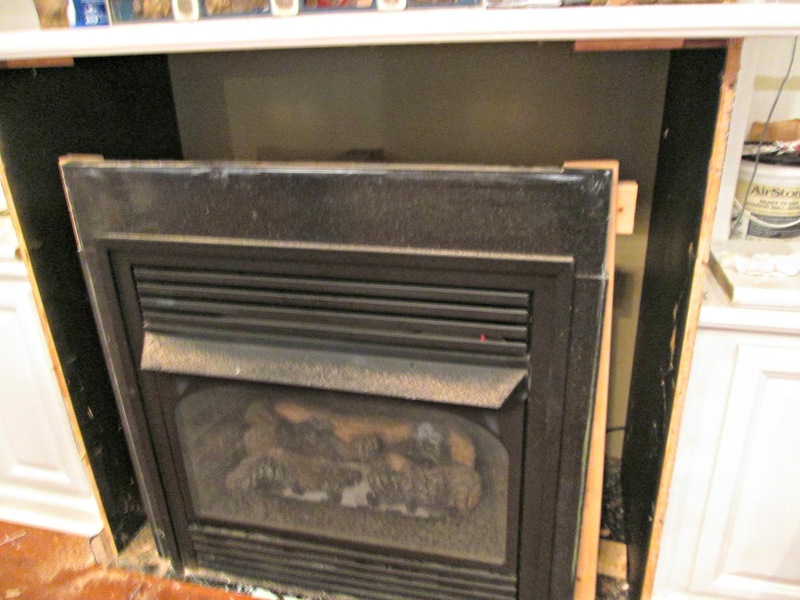 This is a pic of one of the before looks of the fireplace and surround. The picture is covering a huge hole where the tv once was. The mantle is not deep at all, and very difficult to decorate due to being so small. 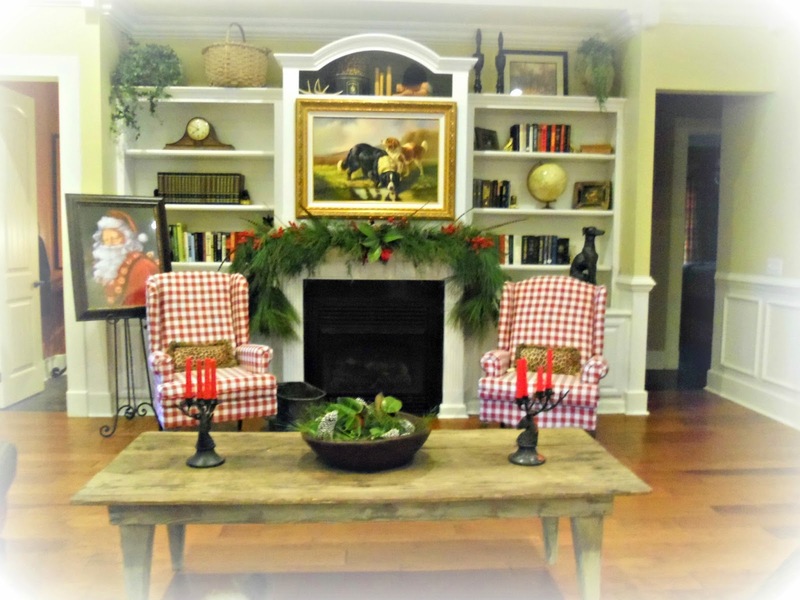 That has all changed now, and I cannot wait for fall....to decorate my new mantle! I am not being paid to do this post for airstone, and I am going to speak the truth. The stone comes in a box, and the particular stone that I used came with 12 wrapped packs. Well guess what, only 4 of the packs were colored, the other eight were the colorless concrete color. Very plain with no personality whatsoever. The stones were broke in most every box, which didn't bother me, but the lack of color did! I got out several different paint colors and stains and went to work. Every box was like this, so it was a very time consuming project having to paint/stain every stone before you could apply it to the wall. These are the ones I started with, then narrowed it down to the colors that I liked best. 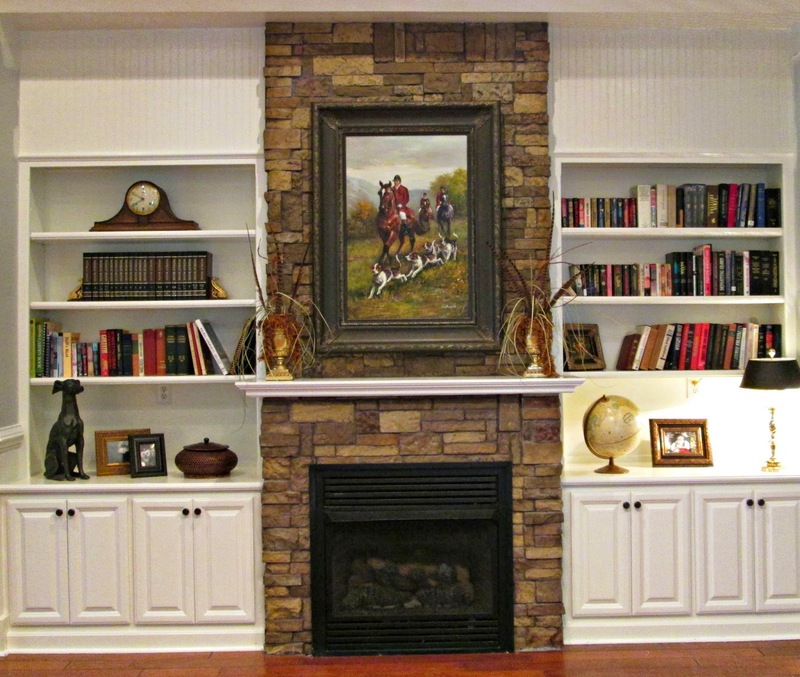 This stone fireplace has really "cozied" up this room, although it has no furniture in it at this point. I just haven't found that perfect, oversized sofa yet, that is affordable, but I will! Sophie was probably picking on her in this pitiful looking picture, she does that a lot. These are Annie's new friends. I rescued a mama dog and her eight puppies, and Annie has been in Doggie Heaven since they came to live on the farm with us, but more on that in another post. I just wanted to show everyone what a wonderful and sweet personality Annie has, and I don't regret for a second taking her in! !